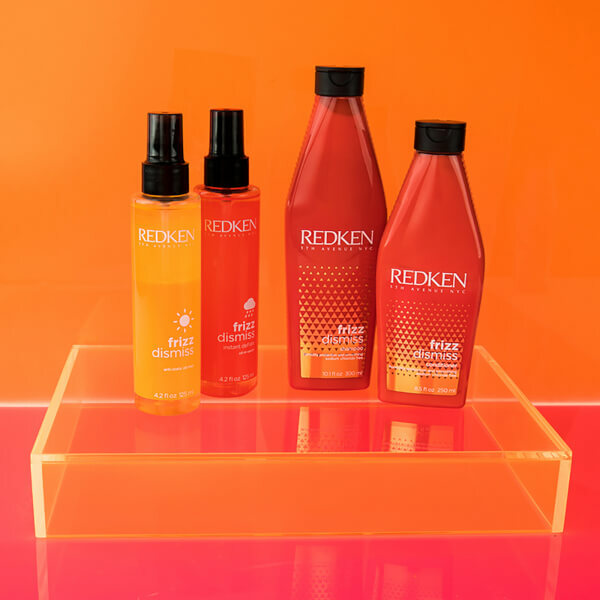 Take control of your hair with the Redken Frizz Dismiss Anti-Static Oil Mist, a leave-in treatment that tackles mild frizz and unwanted static to promote sleek, smooth locks. Nourishing yet lightweight, the oil mist effectively smoothens the look of flyaways and frizz without weighing hair down. Part of the brand's reinvented Frizz Dismiss collection, it contains sustainably-sourced Babassu Oil to provide enhanced smoothness, frizz control, manageability and shine. Expect smoother-looking hair with protection against humidity. 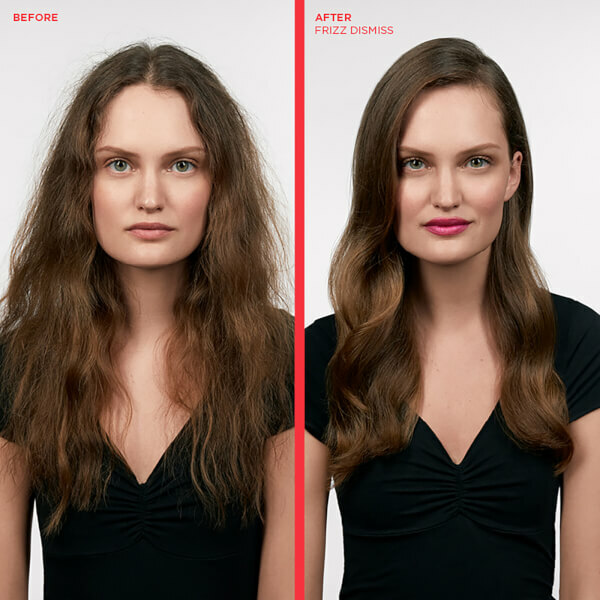 On Wet Hair: Apply to clean, damp, towel-dried hair after using Frizz Dismiss Shampoo, Conditioner and Rebel Tame. On Dry Hair: Mist on dry hair as a touch-up spray as needed to instantly tame flyaways and static. Aqua / Water / Eau Alcohol Denat. Trisiloxane Propylene Glycol Cyclopentasiloxane C12-15 Alkyl Benzoate Aminopropyl Triethoxysilane Lactic Acid Sodium Chloride Parfum / Fragrance Benzyl Salicylate Orbignya Oleifera Seed Oil Benzyl Alcohol Linalool Hexyl Cinnamal Geraniol Amyl Cinnamal Coumarin Caramel Citronellol Limonene Benzyl Benzoate Citric Acid Sodium Hydroxide. This oil stops my hair from being static and holds down my fly-aways. I have been using this to comat the frizz I get with this wintery weather. My hair goes fluffy as soon as I step outside, especially if its raining or foggy. A few spritz of this to finish my look and I am good to go. Great on fine hair, Ive used other hair oils but they make my hair so greasy and I just have to wash it again, this has been working a treat so far. Keeps my hair straight and frizz free even in the rain. Feels like its making my hair healthy and nourished. Great for detangling and giving my hair a subtle refreshing smell aswell as shine. Have used it on wet hair but have read it can be used on dry hair so will be trying this out. Super smoothing and I love the smell. Really decent size which I know will last me a long time. Wish they had a mini so I could take it to the gym with me. Could do with this after a sweaty gym class. Love the smell in this hair mist, it smells like a holiday fragrance. Its non greasy and really easy to use as it’s a pump format. Great to use as a 'on the go' product to keep my flyaways and static at bay throughout the day. Wow this product really works. I have used a few salon brand hair oils in my time but most leave my hair feeling heavy and greasy. Not this one! It smoothes down the hair keeps it looking silky and smooth without weighing it down or leaving any greasy residue. I’m totally obsessed with this product! I have finer hair so this product is great as it gives all the benefits of an oil but not in a serum so its not as heavy on your hair or scalp. I love hair oils but usually find the serum versions too heavy on my hair. This mist is lightweight and can be used on wet or dry hair. So far its been stopping flyaways and frizz which I usually get as soon as I step out the door. Love this new oil mist format. Its much easier to use rather than pumping oil into my hands and then being left with a greasy feel in my hands. Ive tried on both dry and wet hair and it works on both. Love this oil mist, it’s the type of product I will keep in my bag and use on those humid days when my hair is just getting fluffier and fluffier. Has left my hair free or flyaways and static which I usually have after blow drying. Hair still feels lightweight and soft to the touch. My hair is completely smooth now.